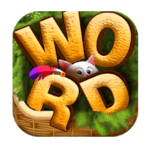 If you come from the topic that talks about Word Cats Level 573, then you are on the right one that will help you for sure to achieve without problem the next one : Word Cats Level 574. The game is a kind of a classic word game where you have to swipe between letters to form words. These words should be valid and are splitted in too kinds : Requested Words and Bonus Words.Since you are here, you will find all the answers and bonus words I encountred. If you find others, please do not hesitate to tell in the comment in order to add it to the list. If the current level became a part of the past, you can open from now the next topic to get some help if you are stuck on some words : Answers for Word Cats 575.